My primary inspiration to attend last night’s gig of the Ari Hoenig-Jean Michel Pilc Project at the Artists Quarter was to again sit spellbound by the alternating grace and frenzied antics of drummer Hoenig. Not that Pilc was not a draw by himself, as the transplanted French pianist has amazing chops. The duo impressed anyone within earshot of their AQ debut last March (supported by a very compatible Anthony Cox on bass). But most memorable for me was Hoenig. Within a few moments of any tune on the setlist, you can’t help but imagine him as a toddler, sitting on the floor of his kitchen in Philadelphia, surrounded by pots and pans and an array of utensils, probably driving his parents toward sonic insanity with his percussive and playful ingenuity. That child-like abandon marks his attack today as one of the most acclaimed drummers of a generation of young giants. Sticks or brushes or mallets (or any combination simultaneously), Hoenig rises above his own arsenal with a variety of “voicings” – if one can describe percussion with such terms. He scrapes the brush handles across the skins, moistens his fingertips to draw a buzz or squeal; he pounds the sticks with the determination of CPR; and strokes his cymbals with the very lightness of being. Last night, as last March, the often maniacal grin that crossed his face left no question that Ari Hoenig was both relentless and ecstatic in the musical moment. But also in that musical moment was Jean-Michel Pilc, whose technique conjures none less than Art Tatum and Oscar Peterson, while his imagination spews forth no one but Jean Michel Pilc. His technique and imagination forged a ferocious partnership that left the AQ audience breathless and light-headed. It hardly mattered if the trio (with nimble-fingered Hans Glawischnig on bass) was free-associating through a cover or original composition, as each segment of the set became a sonic playground in which each musician grabbed his turn, pushing and pulling the notes like elastic before gleefully declaring “you’re it!” For Pilc, that playground was the AQ’s Yamaha, every inch of it, inside and out. One minute he would spin gold filigree with a brush of his fingertips, then launch an all-out assault with flying palms in a sudden burst of pugilistic fury. Of course this was outside the piano—on the keyboard. Reaching inside, Pilc found another orchestra--twang, thud, plip, zing, even coaxing elegant melody without stroking a key. And the amazing hands are connected to the creative brain, a mind that boppishly rearranged Robert Schumann, futuristically recreated Nat Adderley, and danced through what I have to title “The Kitchen Sink Suite” as it contained everything but – bits of Mozart, Bizet, movie and television scores and unending classical themes to be recognized subliminally. Pilc goes well beyond quoting, inserting endless ideas and then weaving them into the surrounding fabric. Later, heading home, my CD player cued up Oscar Peterson. And I heard Pilc’s roots in the take-no-prisoners flurries of notes and hand-over-hand barrage of chords. What if Art Tatum or Oscar Peterson had grown up with rock and post bop instead of stride and swing? Joyous abandon, wild and instinctive. Pilc –like Ari Hoenig-- says it all with his music. 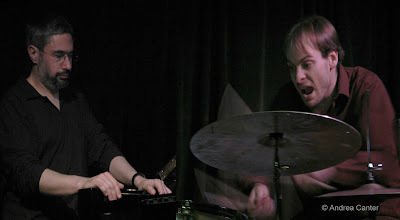 Photo composite by Andrea Canter of Jean Michel Pilc and Ari Hoenig, from their March 2007 gig at the AQ. Pilc requested no photos this time.